Orta Theme for Ubuntu GNOME Just Got Awesomer! We had already featured Orta theme in our listing of top themes to be used with Faenza icon theme in Ubuntu. Orta GTK theme hit version 1.0 today and has become ever more beautiful. The latest version comes with a number of new features and tweaks as well. New metacity decorators with bigger buttons. Two new styles for tabs. New widest size for scrollbars. Extract it and run OrtaSettingsManager.py. This nice little script will take you through the steps needed without any hassles. For best results, you should install Nautilus Elementary and Faenza Icon theme also. Afterwards choose 'nautilus elementary' option from the 'Nautilus' menu of Orta script. 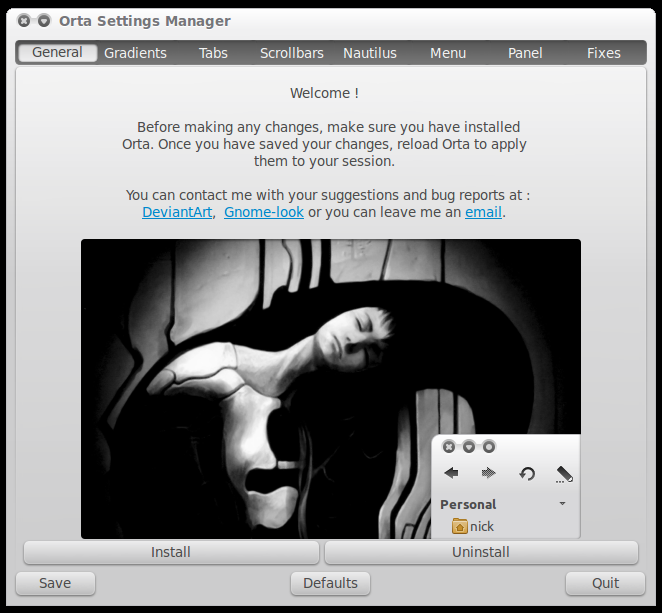 I believe, Nautilus Elementary is at its awesome best while used along with Orta GTK theme. Breadcrumbs hack deserves special mention which alone completely transforms Nautilus and gives it a sophisticated look and feel. See the first screenshot above. For me, Orta + Faenza is the new favorite theme combination in my Ubuntu instead of good old Equinox. How about you guys? Also, check out this collection of 7 brilliant GTK themes.